The Rams battled their way to a goalless draw on Friday night at Deepdale against an in-form Preston side. 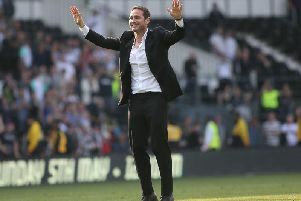 Frank Lampard was without Mason Mount and Jack Marriott, while Andre Wisdom was not seen as fit enough to start although he came on in the second half. Jayden Bogle serving his one match ban meant that players had to be shuffled and a team picked with fewer options than usual. Duane Holmes slotted into the right-back position with David Nugent and Craig Bryson coming into the side for Marriott and Mount respectively. We did look threatening in the first half with Harry Wilson twice hitting the woodwork, but the second half saw our hosts showing most of the attacking play. Some woeful finishing by Preston and some great stops and blocks by Kelle Roos and Richard Keogh saw us grab a point. Many fans were left frustrated at the lack of a centre-half being brought in before the transfer window closed, but you can only bring in what the budget will allow. Those calling for Gary Cahill are seriously deluded! There’s no way we are going to pay £110k a week for any player. Andy King did arrive from Leicester and he’s a good experienced head to add to the squad at this stage of the season. Jacob Butterfield joined Bradford City on loan for the remainder of the season and with him being out of contract in the summer, I think it’s safe to say he is now done as a Rams player. He was signed by Paul Clement and was for a few minutes our record signing until Bradley Johnson joined later that day. Joe Ledley had his contract terminated by mutual agreement and tweeted a nice message to the fans for making his stay with us a good one. He came in and did a job that was needed at the time and most Rams fans wished him well. We are now into February and approaching the business end of the season. What we will need is out players fit and ready as they enter the home stretch. They need the replicate the first half of the season and if that is achieved we will be in the mix. Mason Mount is going to be missing for a few weeks, but hopefully the addition of King will add strength to midfield. It will be interesting to see what part Ashley Cole will play. I’ve looked at some of his MLS games on YouTube and he still adds something going forward with balls into the box. He’s yet to feature, but I’d suggest he will be involved in the next game. Hopefully Jack Marriott will be back next time out as we have missed his energy up front. Hull City visit on Saturday and they have turned their season around with a remarkable run of form. Nigel Adkins' side was struggling near the bottom not so very long ago, but recently dispatched several opponents to lift themselves into the chasing pack of teams just below the top six. We as fans need to turn up in great numbers and get behind the lads Let’s make some noise!